I was up just before dawn Monday, September first, the early morning clouds deep purple against the lightening sky. The storm put all my plans on hold. My original plan was to get a few hours sleep after the Temple burn, then get up about 4 AM to beat the rush of people out of the city. If it was like 2006, I imagined a madhouse: miles of exiting cars lined up for hours trying to get out. On the other hand, the overnight storm probably threw everyone's schedule off, too. It was possible I had a window of opportunity before the mass Exodus began. I decided to make a break for it. Sunrise over the Nightengale Mountains. The rebar I'd staked the tent down with came out easily. The rainfly was tied to the tent, but I'd also staked it down with ropes connected to two regular aluminum tent stakes... and they refused to come up out of the ground. I pulled and twisted, but they wouldn't budge. I needed a pair of vice grips, but I hadn't packed anything like that. Rusty loaned me a pair of pliers. The Sun slowly inched up over the playa. My hands were stiff and the skin was raw from pulling. I wished I'd brought a shovel. I pulled and tugged with all my might, and they finally popped out of the hard ground. Once the tent was loose, I didn't bother folding it up. I just piled it all in the back of Satori. I was so frantic to get moving, I didn't even hook up the bike rack. I just threw it and the bicycle in the back with everything else. I had to go. At about 6:38 local time, I said my goodbyes to those few that were awake and pulled out of camp. Vehicles were moving down the streets. Moving was good. As I came up to the DPW donation station, I pulled over and took out the beer nobody wanted at the bar. “Yay, beer!” smiled the guy at the station. “Merry Christmas!” I said. “Happy Hanukkah!” he replied. Traffic was light as I passed the Greeter's station. Crossing the playa, I passed dozens of traffic cones, strewed haphazardly across the lanes. That told me nobody had been out to set them up yet, and the Sun was already up. Satori's temperature gauge was optimal, but much hotter than normal. I didn't see any Exodus crew until I got to the Gate. Beyond there, cones had been set up for six lanes of traffic in straight, regular lines. Traffic stopped as vehicles bottlenecked ahead. Four lanes of traffic merged into three, then two, then one. As I reached the 2-lane gravel road, I finally saw a flagger with a reflective vest. We were already in one lane of traffic, but he was motioning for people to go into both lanes of the gravel road-- which was dangerous, because vehicles were entering by way of the inbound lane! That was useless. I was listening to BMIR on the radio. After 45 minutes of music, Bobzilla came on. He reported there was "no wait at the Gate." A flagger at the highway stopped me for a passing car, then waved me on. I'd made my Exodus. Fifty-six minutes from camp to pavement? I'll buy that for a dollar! The air was crisp, but I had the windows cracked open as I went through Gerlach. Bobzilla reported that the temperature was 36 degrees outside! That meant it must have been close to freezing when I got up. The road out of Gerlach was open and empty. The Sun rose over the Nightingale Mountains as I headed south. Every few miles, I passed some Burner cars parked alongside the road-- early risers that beat the rush. A couple of the local Indian taco stands were already open, and doing a popular business. Ten miles out of Nixon, my cellphone came alive. I had messages from friends back home. At Fernley, I pulled over into the truck stop parking lot where I'd made my LiveJournal post before the event. The place was packed with Burner vehicles. A special large dumpster had been provided for Burner trash; it was already overflowing with garbage. A sweet Burner lady came by and gave me a gift of a Burning Man sticker. I returned the favor with a spare bandanna. Such a nice gesture! I went inside and washed up in the bathroom. In the mirror, I looked like a dirty hippie. Wait a minute... I was a dirty hippie! There was an Arby's at the truck stop, so I treated myself to one of their big sandwiches. I only ate half, so that I'd have something for later. I got some souvenirs and $20 worth of gas, and then hit the road again. This time, I headed into unknown territory. I got on the interstate, headed east. The wide, Interstate 80 was almost clean of traffic. It had turned into a beautiful day. The route from Fernley east towards Salt Lake City was not completely unfamiliar to me. I traveled it in 2006. The difference was, this time, I was driving my car instead of riding in a train. The train tracks follow the route of the original transcontintal railroad. I didn't realize that when I rode the California Zephyr back in 2006. The road east goes across the 40-Mile Desert and the Humbolt Sink. The signs said it was two hours to Winnemucca. Strong crosswinds blew from mountains of purple and rusty yellow. "Road gators" --pieces of blown tires-- littered the highway. Chunks of rubber flew from the back of a semi I passed. The road must be hard on tires, I figured. Cars and trucks from Burning Man passed me, marked by their deep loads of gear and fuzzy bicycles. As soon as I hit the interstate, Satori's temperature gague went back to normal. She flew down the road, purring like a kitten. In the news, Hurricane Gustav was moving in from the Gulf of Mexico. Yet another hurricane was assaulting New Orleans. I passed fields of freshly cut hay, stacked in bales. Lovelock was full of casinos and motels, and not much else that I could see. I continued eastward. Nevada has a raw beauty to it, harsh yet vibrant. There were lots of Burners on the highway. Just after noon Nevada time, I stopped at a little truck stop in Puckerbrush, Nevada, population 28. Nowhere near Route 66, the truck stop nevertheless sold Route 66 neon clocks. Down the road, I pulled off the highway at Winnemucca. I thought about visiting the train station where we'd stopped during my 2006 trip, but it just wasn't that important to me. I found the Wal-Mart instead. I got film and another disposable camera. The SLR camera's batteries had run down. I stopped for some gas ($3.79 a gallon), a Dr. Pepper, and some beer for later. There were other Burners at the gas station. I knew because they had put tape all over the Budget Rental truck until it read “Fudget.” There was a sign commemorating the Winnemucca to the Sea highway, a route linking northern Nevada with the California coast. Down the road, farms and ranches appeared alongside the highway. Valleys turned greener. Northern Nevada seemed a little more... domesticated than the rugged south. The rest areas along the highway looked full of big trees and very comfortable. Dark, volcanic outcroppings appeared along a southern ridge. I ate the other half of my Arby's sandwich. I drove through a dramatic cut in the Earth to the Golconda Summit at Exit 200, passing trucks struggling to get up the grade. Five miles on, I passed the exit for Pumpernickel Valley. More Burners passed me, waving as they went. Everyone seemed to be in a much bigger hurry than me that day. Just after 2 PM Nevada time I made it to Battle Mountain, "gateway to Nevada's outback." I still had 300 miles to go to Salt Lake City. I found a radio station playing a biography of Eric Clapton. A sign warned of a “dust hazard” ahead. Ha! What do they know about dust hazards? I went through lush, pretty valleys as the road took me into grassy, rolling hills. I was somewhat reminded of the golden foothills of the Sierra Nevadas. Exit 268 took me over Emigrant Pass; there was parking for trucks that needed to cool off after topping the summit. Just before 3 PM, I went through Carlin, “Where the trains stop and the gold rush begins.” The road plunged into a tunnel, and came out surrounded by stately sandstone cliffs. Umber mountains to the south overlooked grassy, green fields. Becka texted that she made it to Reno. I made it to Elko just after 3. A car with Burners passed me; a pretty girl waved. Another carload of Burners gave me the peace sign. Trees popped up alongside the highway. Off to the right, I could see an airport—a small commuter plane was making a landing. Traffic was sparse east of Elko. Exit 348 led to Beverly Hills, and I thought, I am so lost… Past Wells, a green forest seemed to sprout up all around me. Shadows of clouds danced across the mountaintops. I kept passing “prison areas” with lots of signs warning about hitchhikers. How many prisons did Nevada have, anyway —on Interstate 80? Tree-covered buttes led the way to Pequop Summit, elevation 6,967 feet. From there, the highway descended into a sweeping olive-green valley, flanked on the east by blue, spiky mountain ranges. Fluffy white clouds appeared the baby-blue sky. Over the next pass, which may have been Silver Zone Pass, I drove across a wide plain dominated by impressive Pilot Peak. The long, straight highway gave a sense of scale to the landscape. Twelve miles from Wendover, Satori’s gas light came on. Pilot Peak Wendover sits on the edge of the Great Salt Desert, and coming over that last hill was something of a shock. Just beyond the town, the salt flats begin: flat, featureless, and pale white. It looked like the untouched part of the canvas God forgot to fill in. Big signs advertised hotels, restaurants and “loose slots.” The town sits amongst a jumble of rocky hills, some covered with decades of graffiti. Wendover is the only town in Nevada on Mountain Time, so instead of 6:53 it was 5:53 when I stopped for some gas ($3.95 a gallon). The Great Salt Desert, as seen from Windover About three miles east of town I hit the desert proper. The famous Bonneville Speedway rolled past as I headed towards Salt Lake City, 122 miles away. The landscape was amazingly flat. Off to the north was Floating Island Mountain, and the heat off the desert created a mirage that made it look like it was floating. I passed the mysterious Tree of Utah, fenced off just beside the highway. A police car passed me at high speed, lights flashing. The interstate runs in almost a perfectly straight line for about 40 miles, and with a 75 MPH speed limit, they probably get a lot of speeders. I saw three cop cars in ten minutes. There were also signs warning drivers about fatigue. The Sun was low in the sky as the highway turned towards the mountains. It looked like I wouldn’t make Salt Lake before sunset. I passed shallow marshes and wide wet areas. Splashes of forest crept across the mountainsides. Ahead, the waters of the Great Salt Lake appeared to my left, still and murky in the fading light. I got to Salt Lake City right before 8 PM Mountain Time, right as the Sun was setting behind me. My plan had been to make a couple of stops in the city before heading for my selected campsite down near Provo. Of course, that was before the storms Sunday night and the 3-hour delay in getting out of Black Rock. I thought I could camp for the night, and then maybe backtrack to the city before heading on eastward. When I turned onto Interstate 15 south, however, a quick calculation showed it was almost 50 miles to where I’d planned to camp for the night. I was not gonna make a 100-mile round-trip. So, I pulled off the interstate and headed downtown. It was Labor Day. My wife had wanted me to go by the Tabernacle while I was there. It was closed. In fact, it turns out there’s surprisingly little to do in a Mormon town at 8 PM on a holiday... There was one place I could visit, though. Way back when Salt Lake hosted the Winter Olympics, Home Depot had a program where you could have a brick personalized in Olympic Legacy Plaza, which was being built downtown. I managed to find the plaza in the middle of a busy business district, inside an area of restored vintage buildings. The plaza was ringed with the path of custom bricks, which were divided into sections of about a hundred. I searched section seven, going back and forth across the dozens of names… and there it was. 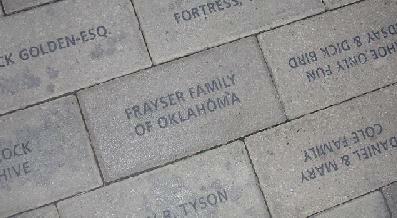 A brick personalized with my family name. It was a thrill to see it was part of downtown Salt Lake, and part of the city’s Olympic legacy. By then it was dark, and I still had miles to go before I slept. 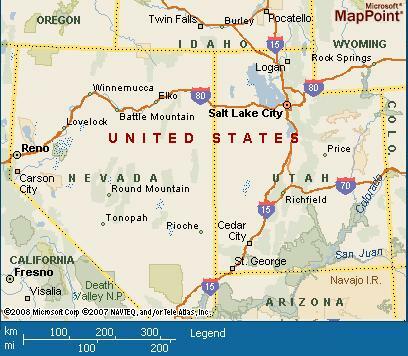 Salt Lake City is huge; the city spread out in all directions from the interstate. I came over a hill, and the lights of the city spread all the way to the horizon… and above. Over the horizon? How were there lights over--? Oh, wait. Mountains. Right. I had in my notes to turn at Exit 254, but well before that I saw a sign for Utah Lake State Park, so I took a chance and turned off the highway. It was a short drive through some residential neighborhoods until I came to the park entrance. Everything was closed, so I put my camping fee ($20) in the slot. The park was very dark, but it wasn’t long before I found a campsite and pulled in. There was a covered picnic table, and lit bathrooms about 40 yards away. The bathrooms were clean and well-kept. I could make out about two or three other trailers and RV’s in the park. In the darkness, I opened the back hatch and started pulling out all the stuff I’d so haphazardly packed that dusty morning. I locked the bicycle against a nearby pole. The bike rack was tough enough to connect to the car in the daylight, so I wasn’t even gonna try it in the dark. I pulled out the tent, spread it out, and got it folded up right. All the time, the lights in the bathrooms kept going on and off. Was it kids? Axe murderers? I resolved to keep myself locked in all night. I got my cot laid out, bundled up against the chill, and quickly fell asleep.